Scoutmob is a Mobile App that connects you with deep discounts at your favorite local shops and eateries. If you live in a major metropolitan area, you should absolutely download this app. You don't have to sign up, log in, or provide an email address to take advantage of the deals. 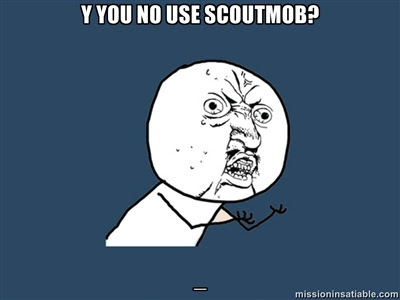 Better yet, Scoutmob is available for iPhone, Android and Blackberry platforms -- you have no excuse to not give it a try. Most deals are for 50% off whatever product/meal, but they also feature 100% off promotional deals. That's right, FREE FOOD from iconic NYC snack spots. In the past month I've scored free Joe's pizza, Mamoun's falafel, and Pommes Frites. Tonight I am about to enjoy a pumpkin whoopie pie from Billy's Bakery in Chelsea. Just make sure you visit during an off hour, or you'll end up like these yo-yo's.